Neither political party seems excited about their presidential choice, although both parties appear to be slowly accepting their nominees in spite of difficulty in unifying and the likelihood of raucous conventions. As the candidates close in on their nominations, their differences are thrown in high relief. Why are Democrats staying with an insider and old party stalwart, Clinton, and Republicans breaking toward an outsider, Trump? Of the many metrics that frame this election, three explain the insider/outsider dichotomy. They are voters’ level of interest for someone with political experience, the amount of political change preferred and the degree of political trust in government. The differences Democrats and Republicans have on the three questions are dramatic and instructive. 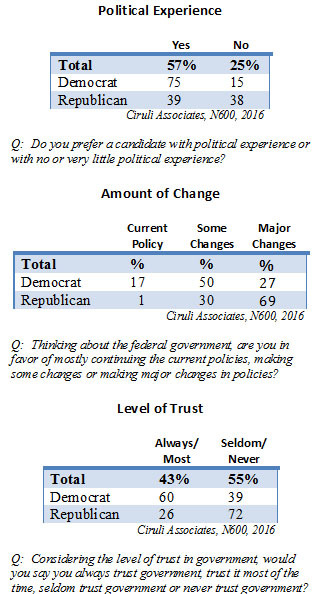 A new Ciruli Associates survey in the Denver metro region shows most Democrats prefer a politician with experience (75%), want some but not major change (50%) in policy, and a majority trust government always or most of the time (60%). Whereas Republicans are the inverse. They are ambivalent of political experience (39% yes experience, 38% no experience), want major changes (69%), and seldom or never trust government (72%). Survey conducted with 600 likely voters in the seven-county Denver metro area by Ciruli Associates in May 2016 with a plus or minus of 4 percentage points. 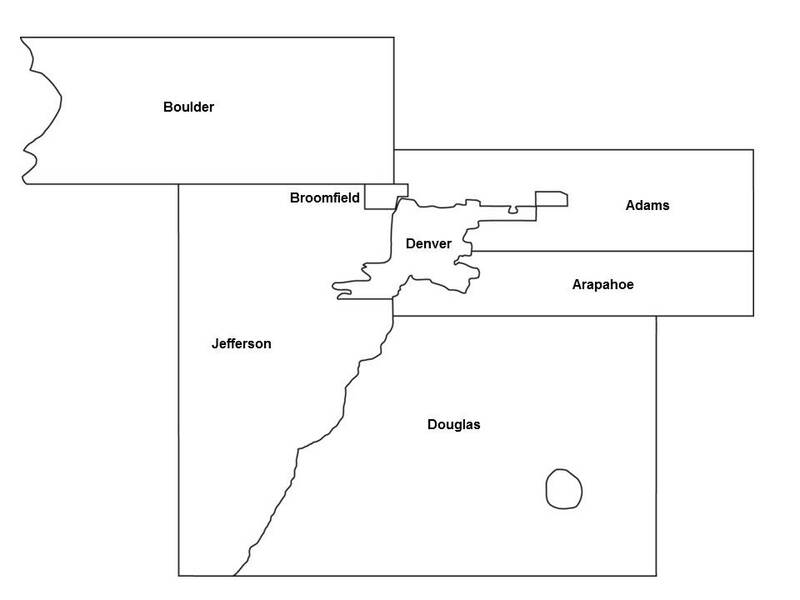 Voters in the Denver metro area may vote for Donald Trump, but not because they like him. 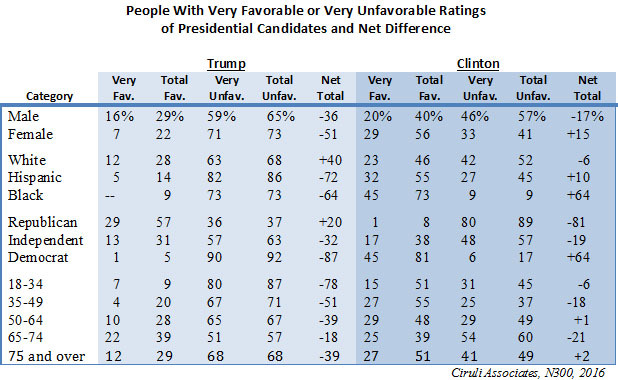 His unfavorability rating is a sky-high 69 percent, a full 19 points less favorable than Hillary Clinton’s 50 percent. As most polls show, Bernie Sanders has fewer detractors, with only a 39 percent unfavorable rating, and the highest favorability of the three candidates (53%). National polls have shown the spectacular poor impression people have of the two frontrunners for their respective parties. It has led this blog to reference to this as the “Regret Election.” Voters will select the candidate they regret voting for the least. The following internal polling data highlights the dramatic feelings voters have for the two frontrunners. 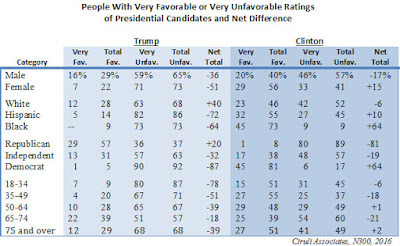 Trump does his worst with Hispanics (82%), Blacks (73%) and Muslims (80%) “very unfavorable.” Clinton’s highest “very unfavorable” ratings are men (46%), Whites (42%), independents (48%), and her age cohorts 65-74 years old (54%). Survey conducted with 600 likely voters in the seven-county Denver metro area by Ciruli Associates in May 2016 with a plus or minus of 4 percentage points. One-half the sample of 300 likely voters has a plus or minus of 5.6 percentage points. The Denver metro area leans Democratic in its partisan preference, and Governor Hickenlooper and President Obama both have positive approval ratings, 61 percent and 57 percent, respectively. But Senator Michael Bennet, who is facing re-election, has only a 49 percent approval, with 26 percent opposition and 25 percent of voters with no position. 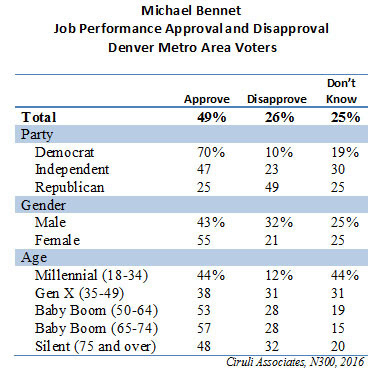 Like most Democrats, Bennet wins women’s approval (55%) more than men (43%) and, of course, he does well with Democrats and the region’s minorities. No doubt, Bennet’s numbers will improve. Washington politicians today suffer from a generalized mood of distrust. He has already started advertising to address the quarter of voters who can’t judge him today. 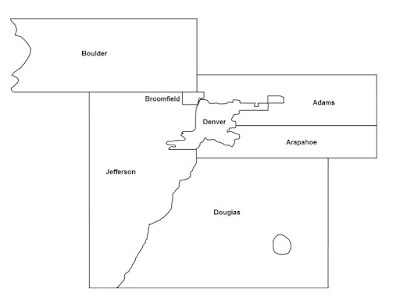 The metro area produces more than half (56%) of the state’s vote and about 65 percent of the statewide vote for Democrats, so rolling out of those seven counties with a big margin is a Bennet priority. The ballot initiatives of the environmental movement are struggling to attract media, activists and funders. The politics of 2016 is simply not as hospitable for the anti-fracking/anti-gas and oil message as it was in 2016. A lot has changed, and the anti-frackers haven’t changed their basic approach. 1. Gas and oil development is simply not the threat it was in 2014. The mega expansion phase collapsed with prices. Today, gas and oil is contracting with lower rig counts and fewer employees. 2. In 2014, the anti-gas and oil crowd had a number of Front Range communities that joined the movement, not out of an environmental ideology, but due to a desire to keep the development out of their cities (NIMBY). Partially, that threat has receded, and importantly, their strategy of local bans was voided by the Colorado Supreme Court. The communities are no longer providing resources or rhetoric to back the initiative effort. 3. Although the environmentalist have tried to broaden their appeal by incorporating local government and environmental quality into their anti-fracking and anti-gas and oil initiatives, the gas and oil industry got organized and has spent millions in television advertising and public relations to counter the effort. Public affairs weekend programs are flooded with the benefits and positive aspects of gas and oil development. Industry spokespersons rapidly counter each environmental initiative and statements. 4. The environmental movement has had victories. The Keystone Pipeline will not be built during the lifetime of this administration. But, its fall also removed at least one issue that fueled the movement. 5. A key missing aspect of the movement is the absence of a money source. Jared Polis, who provided millions in 2014 to get anti-fracking measures to the ballot, has shifted his emphasis to become a part of the House leadership. It was made very clear to Polis in 2014 that sponsoring party dividing anti-gas and oil ballot initiatives in Colorado was not welcome. In addition, many of his communities in Larimer County are simply not energized about the issue in 2016. 6. Finally, much of what passes today for the environmental movement has lost currency with the public. The percentage of the public calling themselves environmentalists has declined from 78 percent in 1991 at the beginning of Earth Day to 42 percent today. Gallup, which reported the data, points to the increasing partisan division in the term. 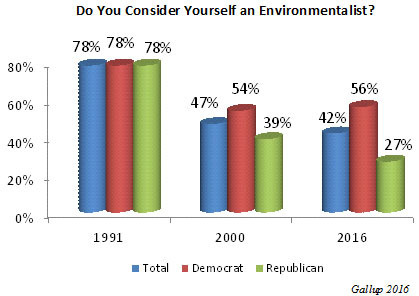 Environmentalism became much more partisan, especially around climate change. Only 27 percent of Republicans consider themselves environmentalists. However, even the larger proportion of Democrats (56%) is still way down from the 78 percent who held the position in 1991. 7. Also, Gallup points out that the public has adopted many environmental positions, such as recycling, industry uses more solar and natural gas, and major problems of a few decades ago, such as air pollution, have seen major progress. The anti-fracking amendments may make the ballot, but, as of now, it will not be the cause celeb it was in 2014. John Hickenlooper has just published a book. It’s de rigueur for a politician trying to move up. Hickenlooper has been on lists for several years as a potential vice president prospect. Previously, he denied an interest in going to D.C., but since his re-election, Hickenlooper has been much more animated about a trip back East. And, it makes sense. He’s near the end of his term as governor. There is no senate seat available. The gubernatorial position in Colorado is constitutionally weak and Colorado government has been tied into a fiscal knot since the 1992 passage of tax limitation amendment, TABOR. He likes politics and is pretty good at it. His regional approval rating is 61 percent. 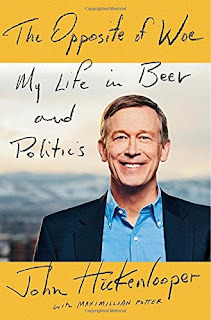 Since his 2003 political career started, Hickenlooper’s had good timing. He began as a type of non-politician, and it was an image that fits him and fits the public’s mood. He still benefits as an independent politician who will reach across the isle to get things done. 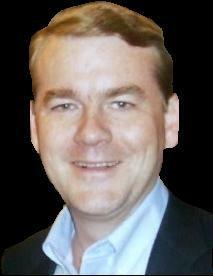 A Democratic business moderate and social liberal is a niche position that has mostly worked in Colorado. 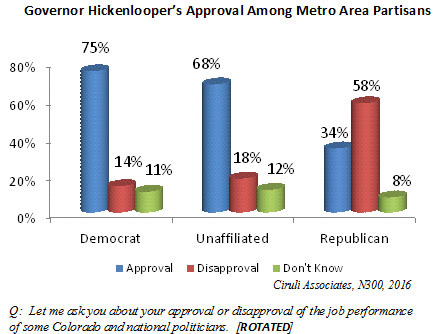 Although Hickenlooper might be compatible with Clinton, it’s not clear he brings much to the ticket. Colorado is a small state and Clinton’s main challenge has been her left, not the center of the party. In addition, the Democrats’ core constituents come out of its politics of race, ethnicity and sexual-identity. But for its size, Colorado has produced a number of politicians who were major forces in the Democratic Party – Gary Hart in the 1980s, Roy Romer in the 1990s and Ken Salazar in the Obama era. Will Hickenlooper join them? John Hickenlooper has a 61 percent approval rating among Denver metro voters. His age contemporaries approve him the most. Voters 65 to 74 years old give him a 68 percent approval, a rating he also received from post college degree holders. Not surprising, his lowest approval numbers come from conservatives (35%) and Republicans (34%) and his highest from liberals (82%) and fellow partisan Democrats (75%). 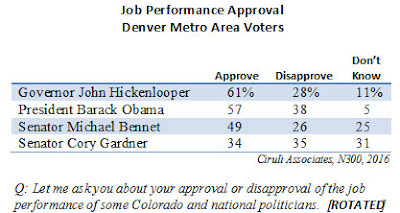 Given Hickenlooper’s independent reputation, he does well among unaffiliated voters (68% approval). 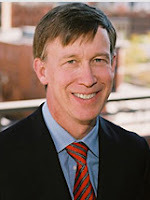 Hickenlooper continues to be listed as either a prospective vice president on the Democratic ticket or member of a new Democratic cabinet. 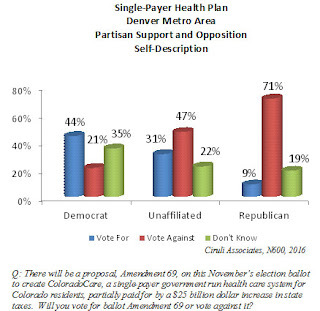 This poll appears to make him valuable, at least in Colorado, a swing state in the presidential election. 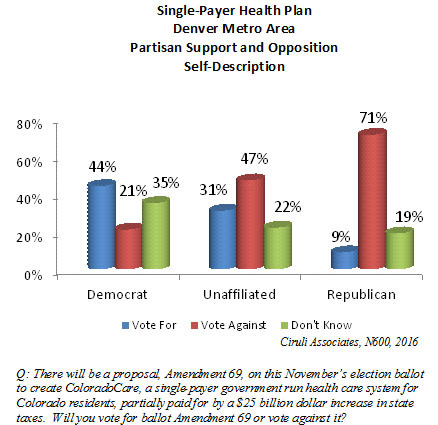 Amendment 69, the nationally reported single-payer proposal on the Colorado November ballot, is currently losing in the Denver metro area by 30 percent in favor and 43 percent against, with more than a quarter of the population undecided (27%). A plurality of Democrats (44%) favor the amendment and a third (35%) are undecided. Republicans are overwhelmingly opposed (71%). Unaffiliated voters oppose it 47 percent to 31 percent. Also not surprising, given their ideological disposition, 43 percent of voters under 30 years old favor the proposition. Older voters were less supportive, with Baby Boomers aged 65 to 74 years old the most opposed (53%). A new Gallup poll shows that the single-payer option attracts both Democrats who see the Affordable Care Act (ACA) gaps and failures and Republicans who simply want any alternative. In the May 8-10, 2016 Gallup test, Americans were offered three options, which are also associated with the three current leading candidates for their respective party nominations, Bernie Sanders’s single-payer (Medicare for All) approach beat Hillary Clinton’s “Keep the ACA” and Donald Trump’s “repeal the ACA” (and replace it with an unknown option). A new poll of Chicago residents shows a very dissatisfied public, and crime is the main concern. The poll, conducted by the New York Times and the Kaiser Family Foundation, has a number of data points that can be compared to a recent Ciruli Associates poll of Denver residents, which also reported on a public’s view of their community’s direction and major problems. Chicago and Denver residents have very different views of the direction of their respective cities. 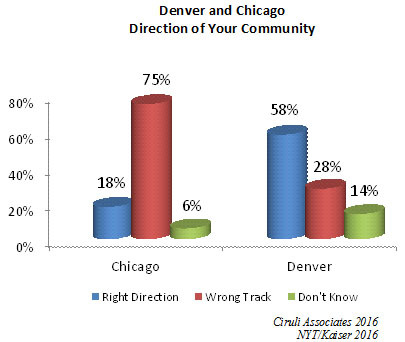 Three-quarters of Chicago residents believe their city is on the wrong track. In contrast, more than half of Denver residents (58%) believe their city is moving in the right direction. When asked what the community’s major problem is, Chicagoans said crime, violence and gangs, with 52 percent citing it. Education and schools was second with 8 percent. In Denver, crime is the fourth highest problem listed (12%). Affordable housing is cited as the most serious problem (27%). In the 1930s, Pueblo was known as “Little Chicago.” It was a workingman’s town, it was full of ethnic families and it had a bootlegging industry. Pueblo was also a waystation for some Chicago organized crime elements going to Las Vegas, Los Angeles or Phoenix. Today, Pueblo unfortunately rejoins Chicago in its high level of crime. Pueblo was recently cited in the Denver Post as a “murder capital” and a story in the New York Times described it as deeply entrenched in gang activities spanning family generations. The public in both cities are gripped by concern about crime. Chicago also has seen a record murder rate and the recent police shootings have cast a negative national spotlight on the city. In a new poll from Chicago on police and other community issues conducted by the New York Times and Kaiser Family Foundation, 75 percent of residents believe the city is on the wrong track and 52 percent believe crime, violence and gangs are the top problems. 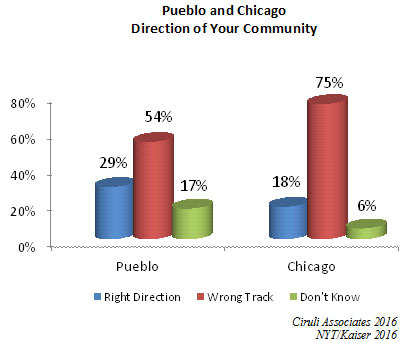 A recent Ciruli Associates poll of Pueblo residents showed 54 percent believe the city is on the wrong track and crime, gangs and drugs are the main problems in the opinion of most residents (61%). Once again, Chicago and Pueblo are struggling with a surge of crime that is shaking up the politics of the cities. While the Denver metro area population continues to surge with streets, restaurants and parks full of new residents, especially Millennials, the sales tax measure of metro area retail continues to sag. After several years of 5 percent or higher growth (7% in 2013), the year-to-year- comparison of the first three months of sales tax collections in the metro area was down a fraction (.0005% decrease in YTD 2016 over YTD 2015). Each one percent of sales tax in the Denver metro area provides about $550 million in sales tax revenue for state and local governments. Republican House Speaker Paul Ryan tells CNN’s Jake Tapper (nice interview for Tapper) that he can’t endorse presumptive nominee Donald Trump. It was a bold and controversial stand. As the top leader of the party, he was ensuring, at least a few days, including a big news weekend, unbelievable noise, probably more angst from allies and criticism from Trump than praise. But for a party short on high-profile stands on principles, it may prove a long-term winner. Ryan represents a House majority that is endangered by Trump. In fact, more than half the record-breaking primary electorate did not vote for Trump. Remarkably, along with general conservative principles and the need to protect Republican majorities, Ryan, when asked, took on Trump for his ban of Muslims entering the U.S. The American people do not agree with Trump’s position. A number of polls since Trump’s statement last November show more than half of Americans do not support banning people who are Muslims from entering the U.S. But Trump is highly unlikely to change his position. The same polls also show large majorities of Republicans do support the ban, and as new attacks take place, such as in Brussels on March 22, 2016, opinion tends to shift toward support. Who Will Have the More Fun Convention: Trump or Clinton? As of today, Hillary Clinton may face a tougher challenge unifying the Democratic Party behind her than Donald Trump. Trump’s decisive win over Ted Cruz in Indiana has brought the Republican nomination race to an end. But, although Hillary Clinton’s delegate campaign is over, she still struggles with Bernie Sanders in voting contests, losing Indiana by five points in an upset. Unfortunately for Clinton, she can’t start her fence mending yet and additional loses between now and the June 7 California primary will add to the difficulty. But Trump’s outsider position and aggressive campaign leaves major elements of his party still strongly opposed to him as the nominee, and for some, even as the president, regardless of the “R” after his name. Trump can fill the convention with passionate constituents, but the leadership may be scarce. Although the most pragmatic elements of the party establishment will get behind the nominee, much of it will be grudging and low key. 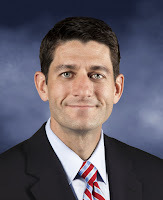 Many who are up for re-election or responsible for the party’s success (Speaker Ryan) will wait for additional indicators that Trump is not the Barry Goldwater of 2016. Conservative talk show hosts and public intellects are struggling to find a rationale for supporting Trump. Many have made apocalyptic predictions of Trump’s impact on the party in November. In just winning the nomination, they see him damaging the conservative cause and their influence in the Republican Party. The Republican Party’s foreign policy establishment may be the most riled about the Trump candidacy. Trump regularly attacks many of the policies of the party and its presidents in his broad-ranged criticism. Free trade, alliance policy, Russia, immigration and Middle East engagement are topics Trump’s position is barely near the outer edges of establishment’s foreign policy principles. Clinton is attempting to pivot to the general election, but Sanders is a major stumbling block. He continues to do damage to her electability, even against Trump, who has record-breaking negatives. Clinton has the establishment, but she must use the convention to address problems with key constituencies. 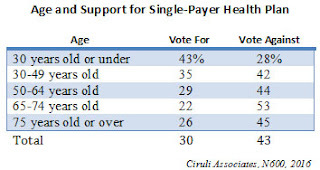 The Millennial vote that Sanders has a lock on will not be easily won over. Large numbers tell pollsters they may not vote for president. A few claim they will vote for Trump as the change agent, even if he is not in alignment with many of their views. The party’ dominant liberal wing does not trust Clinton to make the changes they prefer. Many believe that she is a corrupt agent of the status quo. They will vote against Trump, but it will be reluctantly, and a few percentage points of drop off can shift a swing state. The Democratic Party has long had a problem with White men. It is now becoming a 30-point plus difference. As of today, it is not clear who has an easier convention. The Aurora Sentinel reporter Rachel Sapin with colleagues does a story on early impact of Trump on Colorado’s Republican congressional delegation and senate primary candidates (a number that changes daily). 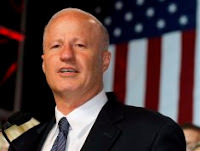 Floyd Ciruli, a nonpartisan Denver political consultant, said Coffman’s reaction shows that Colorado conservatives are looking for ways to disengage from Trump’s campaign while not also alienating the state’s Trump supporters. “While this was a Ted Cruz state in terms of people that showed up for caucuses and went onto to Congressional conventions, there are Trump supporters out there,” Ciruli said. Ciruli said Coffman’s campaign will also have to figure out how to keep the campaign from receiving the tail-end of future Trump backlash. Coffman faces Democratic state Sen. Morgan Carroll of Aurora, formerly state Senate president and known for not pulling punches on the Senate floor or during previous campaigns. “That’s his challenge,” Ciruli says. “He’ll be running with a candidate (Trump) that has a long track record of saying controversial things.” Ciruli says Colorado Democrats will likely use the opportunity to attack Coffman by riling up local press about whether the longtime incumbent agrees with Trump when the candidate makes divisive statements. Carroll made it clear supporting Trump would be a campaign issue starting now and used the opportunity to attack Coffman when asked about Trump’s nomination. “Trump is bigoted, misogynistic, and absolutely dangerous when it comes to our national security,” she said in a statement. “It says a lot about Congressman Coffman that he would be supporting Donald Trump. The reality is that Coffman’s own divisive rhetoric has echoed Trump’s and hurts hard-working Coloradans." In a major decision, the Colorado Supreme Court asserted the state’s rights over gas and oil regulations within municipalities and overturned fracking bans (one moratorium treated as a ban) in Longmont and Fort Collins. The bans were passed in the heat of the oil and gas boom of the last five years, a boom now tapered off. It will be controversial for the two cities to spend more taxpayer money on appeals given most observers believed their cases were marginal. The action now shifts to the political arena with various anti-fracking groups proposing bans for the ballot. I point out to Dan Elliott of the AP (May 3) that a single ballot issue has less impact on voter turnout in a presidential election than a lower turnout even year election, such as 2014 when senior Democrats were concerned gas and oil conflicts could hurt Democrats on the ballot. However, I do think fracking can affect legislative races in certain districts. Jack Healy in the New York Times (4-28-16) reports a long story on the effort of some Colorado progressive activists and doctors to replace Colorado’s effort to implement Obamacare with a single-payer system called the ColoradoCare plan. Its cost, a $25 billion annual tax, has gotten the attention of the business community (Healy cites a $38-billion-a-year cost). The story points out that both Republicans and Democrats either don’t like Obamacare as an ill-conceived welfare program or an inadequate progressive entitlement, respectively. 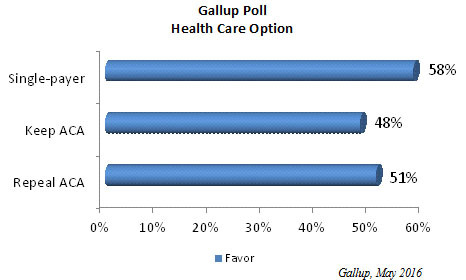 Hence, the proponents could benefit from the broad dissatisfaction with Obamacare among members of both parties. Bernie Sanders forces, who are numerous in Colorado, are supportive and some helped it get on the ballot.